When it comes to performance exhaust systems, most people are looking for three things: Power, sound, and quality. JBA Exhaust Systems deliver the best of all three, giving it both great looks and performance. One of the first performance upgrades typically made to a vehicle is the addition of a performance exhaust system. While there is a high demand for performance sound. the capacity for power in a JBA exhaust system gives JBA the extra edge. Each system is tuned to provide the best possible exhaust tone without being overwhelming from within the vehicle. 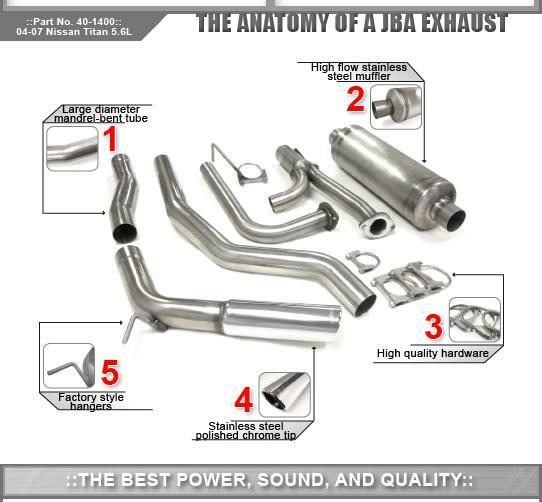 By replacing the restrictive factory exhaust system with free flowing mandrel-bent stainless tubing and quality performance mufflers, JBA has developed the power, sound, and efficiency desired in a vehicle. Each kit is finished with a polished chrome plated stainless steel tip that resist discoloring, along with high quality hardware and thorough instructions for a simple bolt-on installation.